The thyroid gland is a crucial gland in your body. 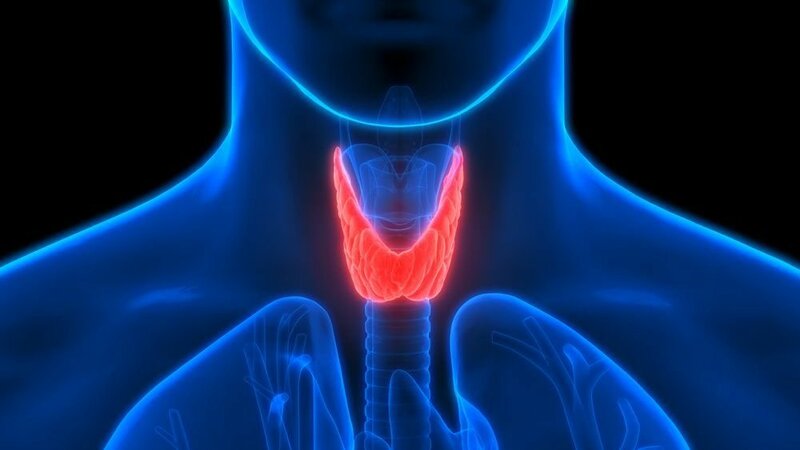 Located in your neck just next to the Adam's apple, the thyroid is responsible for secreting two essential hormones: thyroxine (T4) and triiodothyronine (T3). These hormones are crucial for the cells in your body to work properly, as they regulate the speed and activity that the cells work at. If there are too many of these thyroid hormones being released into the blood, the cells in your body work faster than is normal; if not enough of these hormones make it into the bloodstream, then the cells of your body (and your organs) begin to slow down. The name for too much thyroid hormone secretion is 'hyperthyroidism' - and symptoms of this kind of thyroid disease include anxiety, irritability, increased heart rate and increased bowel movements. The name for the other kind of thyroid problem is 'hypothyroidism' - and this is where too little thyroxine is created for the body's requirements. Symptoms of this disorder include weight gain, tiredness, feeling cold all the time, and even depression in some cases. One aspect of the body's cellular processes the thyroid gland has a particularly strong influence upon is hair growth. Rather than growing continuously, the hairs on the scalp go through phases of growth and elongation, followed by a period of rest and dormancy. This dormant period is known as the 'telogen phase' - and it is during this phase that old, dead hairs are shed, to be replaced by new ones. Unlike many animals, such as dogs, whose telogen phase is synchronized and leads to many hairs being shed at the same time (or molting), human hair growth is staggered and uncoordinated. This means that at any one time, a human head of hair will have individual hair follicles at different stages of the growing process, and so continuously shedding hairs is quite normal – with around 100 hairs per day being a healthy amount. Stress and illness can be very common causes of hair loss, and this is known as 'telogen effluvium'. If stress or illness is severe enough, it is perfectly possible for all the hair follicles on the scalp to enter their 'resting' phase, and for all hair growth to stop temporarily as a result. Because of the lengthy process of the hair-growth cycle, it can often be many months before the hair loss becomes noticeable, and this is often past the point at which the person has already recovered from the illness, and the hair has started to grow back. Thyroid disorders such as hyperthyroidism and hypothyroidism (as described above) can very often cause loss of hair, due to the negative effects they have on the metabolism and on cell processes. Hair loss associated with these conditions is usually spread across the whole scalp, rather than in separate areas, and the hair will look consistently sparse – although it may take several months for the hair to be affected even after the onset of these conditions, due to the nature of the hair-growth cycle. Although hair loss from thyroid disorders can be unsettling, it is important to remember that the hair will usually grow back with successful treatment of the underlying thyroid disorder. Thyroid disorders can be treated with medication, and can sometimes be treated by increasing your intake of protein, which can help to regulate the production and function of thyroid hormones – although it is always best to take advice from your physician. However the best approach is a natural one. At Black Hair Clinic we use Sea Kelp because it supports Thyroid health. We use a brand called natures way which you can buy here. Hair loss, whether related to a thyroid condition or not, is an increasing complaint of women with Afro hair – and there are several possible explanations for this. Hair thinning (or Alopecia) in Afro hair is often associated with hair-styling techniques commonly used by black women – such as braids that are woven tightly, or harsh, chemical relaxers and hair straighteners. If you suspect you have hair loss relating to one of these conditions, or think you may have an underlying thyroid problem, it is always best to seek expert medical advice so that you can choose the appropriate course of action.